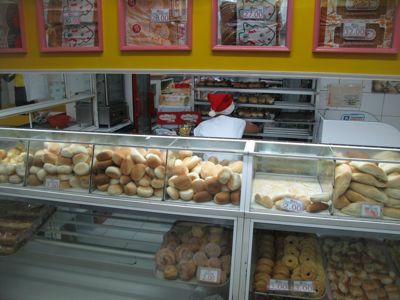 A quick stop at a roadside Julie’s Bakery that was open at 5:30 a.m. yielded a large bag of freshly-baked, medium-sized pan de sal that were surprisingly good. Not too sweet (though not salty either) and just out of the oven, they beat a lot of Manila pan de sals by a noticeable margin. And at PHP2 a piece, they were reasonably priced. I think I ate almost a dozen. It was nice to see areas preserved as forests, and the trees sending out branches to reach for space that received sunlight. I imagine the whole country used to be blanketed in foliage like this, but today it is a rarity indeed. 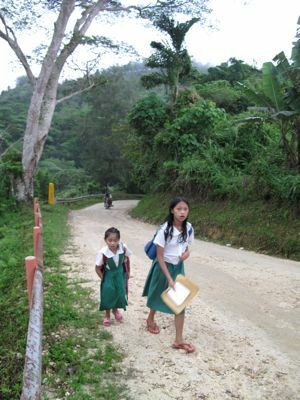 A frequent sight along these rough roads were students trekking several kilometers up or down the mountain to attend school. 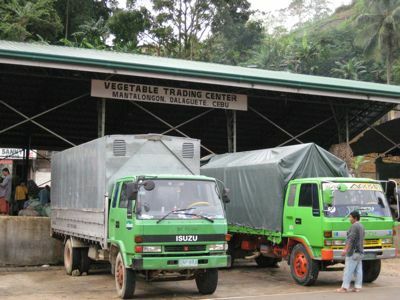 When we finally got to the Mantalongon vegetable trading center, we were amongst several trucks from the city, all coming to load up on vegetables at the cavernous, gym-like area where deals for humongous baskets of vegetables were completed. More on the market, up next. 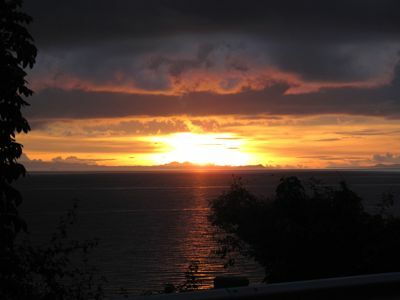 Spectacular sunrise! Yes, you are absolutely right pan de sal are their finest when they are fresh out of the oven capturing in the roof of my mouth the aroma, taste and heat they eject. never knew there’s a place like this in cebu. have always wondered, too, why Dalaguete is always pronounced without the last “e”. Dalaguete was were my father’s family hibernated during WW2. The brother of my paternal grandfather built a house there and we use to go up during holy week and summers in the 70’s and 80’s. We enjoyed fresh green vegetables and strawberries then. Good morning, MM! What a wet, gloomy day this is, perfect for one of Julie’s pandesal dipped in sikwate, no? 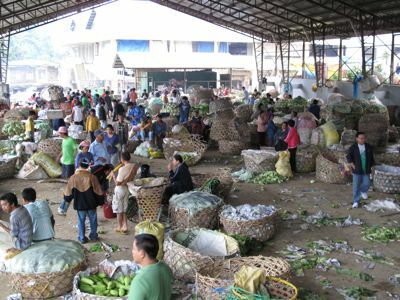 We dropped by the Dalaguete market on Dec 26th, hoping to buy lots of veggies but surprised so few were on sale and of rather poor quality at that (severely malnourished carrots etc). The fantastic bargain though was large saba banana sold at 10 pesos for 7 pcs, grabeng barato, di ba? Your blog today is great timing, I’m looking forward to more stories of veggies in Mantalongon. According to my friend who is a municipal councilor of Dalaguete, it is pronounced as Da-la-git. Though I’m not one to argue with someone from the area, I distinctly remember relatives who live in Boljoon refer to it as Da-la-get-e. Of course, this comes from people who live in an area where the Cebuano dialect has a bit of a sing-song intonation to it, rather than the usual Cebuano spoken in the city. It’s best described this way: if the horn of a car while in the city would go “ti-det”, upon reaching southern Cebu (in particular Boljoon), the horn would go “ti-deeeeyt”. I remember taking a trip crossing the island of Cebu through Carcar and then very rocky trails, unfortunately so much of the forest had been cut down in the central mountainous region. I do hope more barangays start replanting trees. MRU, my friend would always cringe everytime he hears somebody pronouncing it as da-la-ge-te. 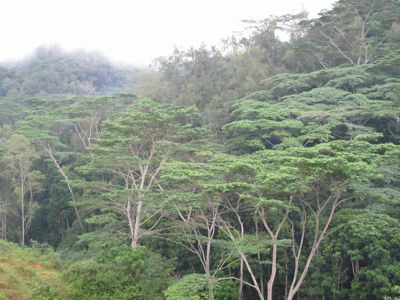 Dalaguete got its name from dakit or dalakit, the local name of the balete tree. Thus, it makes sense to pronounce it da-la-git. we say it with “i” da la git…. What a beautiful daybreak photo, worthy to frame! 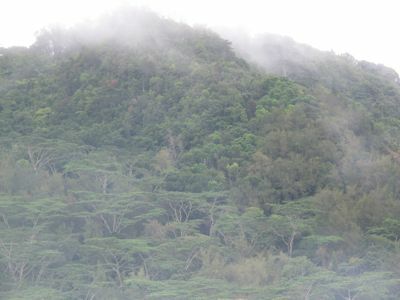 MM, where the pictures of the forest of Osmena peak? maricar and homebuddy, the first photo is nature at its best, all I did was click my digital camera on an auto setting (I am too dopey to mess with manual settings so far). Proof positive that some of the best things in life are free. My Pal said we psssed by that place last sunday…sadly the weather was really cold we went to Mantayupan Falls….hope you went there too MM….just to boost local tourism that is…. weee…got it wrong my companion said mantalongon is on the way to Boljoon…..sorry po…. Am from Barili. Thanks for the plug on Mantayupan Falls VJ. I like to go to the tabo in Mantalongon whenever I visit. Good fresh veggies and you get a good deal too. I believe the present Mayor is trying to improve it even more. I was there last year during the Holy Week and I did not notice the sign Mantalongon-Dalaguete Market. That is a beautiful sunrise picture, MM. I meant the mayor is trying to improve the place, not the veggies. He he.